CoDex 1962 is Icelandic author Sjón’s first new novel since Moonstone – The Boy Who Never Was, published in translation in 2013. I was not expecting anything straightforward from Sjón; he messes with your head. But I was not prepared for this unnerving, drawn-out waking dream. This novel has special significance for me: Like Sjón, I was born in 1962. I wondered what the title meant, and I think now I have some idea. But logic and interpretations of the story itself aside, the novel Codex 1962 is also simply a “codex” – which is a Latin term for a book constructed of a number of folded sheets, the format which is now standard for printed books in the Western world. In fact, Iceland has its own Codex Regius (meaning “(The) Royal Book”) a codex of 45 vellum leaves, thought to have been written in the 1270s. So this novel’s title could be a simple statement, “The 1962 book with 517 pages”. But the title is the simplest part of the book. This is a very important novel, not because it is by Sjón, per se, but because he has written something unusual, strange and thought-provoking. In many ways, it is a fictitious portrait of Icelanders and Iceland – their key characteristics, the high points in their history, what makes Iceland, Iceland – the language, the ubiquitous poetry-writing, stamp collecting mania (? ), goats, naming conventions, weather, landscapes, etc. Some novels don’t stand up to too much interrogation – this one will be analyzed and taken apart over and over, and I doubt whether the full depth of it will ever be explained. This review, therefore, will take more than one post. I have to say that regular Sjón translator, Victoria Cribb, did a wonderful job and maintained Sjón’s flowing writing style and surreal imagery. Sjón, photographed for the Reykjavik Grapevine, published October 16, 2018. All three of the main parts of the book were originally published in Icelandic, in 1994, 2001 and 2016 respectively. Whether he started to create a single, consistent narrative back in 1994, with a view to this all-encompassing journey, I do not know. However, the end result, in 2018, is a novel that hangs together perfectly in every respect. The three-part book is in part like a primitive form of the codex; a scroll – with many pages that contain only lists of names, genders, birth dates, death dates and causes of death. Those pages are a kind of direct graphical expression of the names – presumably of the real children (2,410 boys and 2,301 girls to be precise) – who were born alive in Iceland in 1962, and who died and what they died from. It’s right in your face, all those names and dates, like the engravings on a memorial wall in a cemetery. What else, other than accidents, might have caused their deaths, becomes clear later on in the book. 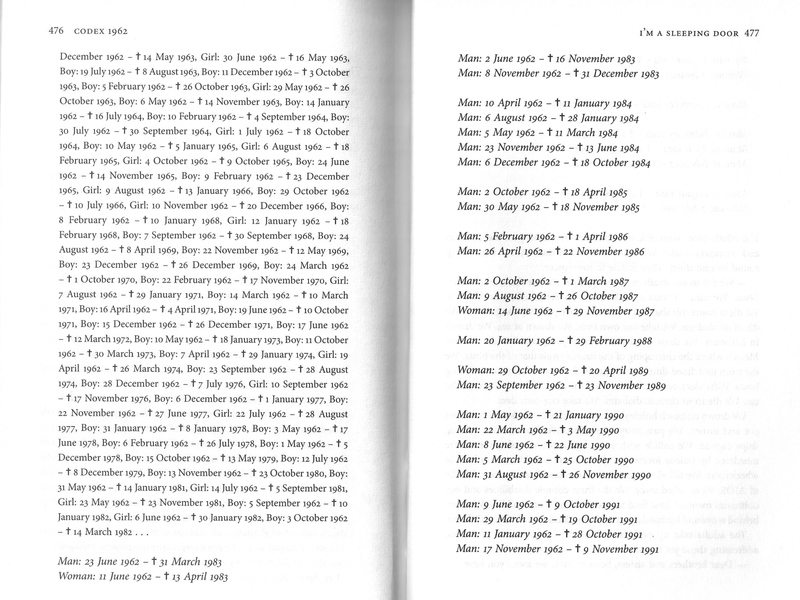 Extract of pages with lists of the dead. In many chapters, the dead children and adults gather, as a chorus of the dead would do in a Greek tragedy on a stage or proscenium, and, speaking to an invisible audience, they recite their names and deaths, and conclude with “- Dear brothers and sisters, born in 1962, we await you here.” That really sent chills down my spine, since the lists grow longer and longer every time. You cannot imagine how creepy and clearly visualized these scenes are. But I swear, they are so detailed, all those names and deaths, that Sjón would’ve had to have looked up all those records. Good grief. They seem to hold up the causes of their deaths like masks or props, pointing to the audience, to whoever is to blame, out there in the dark.